The company BOLZ INTEC manufactures laboratory utensiles for numerous uses. 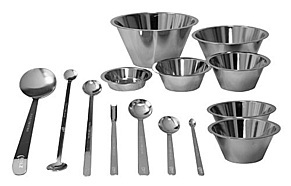 Starting with laboratory spoons of various sizes, spatula spoons, double spoons, through to petri dishes, all types are either made of high-quality stainless steel (1.4301/1.4401/1.4435/1.4571) or special materials like Hastelloy. Depending on demands, the kits are as well available in different finishes such as rolled, brushed right up to electro-polished finishes. The lab kits are resistant to acid and due to their electro-polished finish a clean metallic surface was created, i.e. the risk of corrosion is eliminated. In addition, the BOLZ INTEC laboratory kits are easy to clean. All kits are available including laser marking customized to your wishes and needs. Contact us, we´re happy to make you an offer.